Hello my lovelies! Thank you all so very much for your well wishes on my blog yesterday, I was truly overwhelmed! Thank you! But I will be going back once in a while for a top up of medication ;) Anyway, the swelling is going down little by little, I am starting on solids now (nothing too hard to chew still) and the stitches will be coming out next week! Well, on to today's post. Today I am linking to two challenges, one of which I have only entered a few times and one I have never entered . . . there are only so many challenges one can do isn't there? With added sparkle - my added sparkle comes from the pearlised cardstock and sequins. I am going to try and use at least one item of NBUS on every card I make for a while, until some new 'got to have' item comes along! So pleased to hear that Doctors Ben and Jerry are winning with your treatment and don't forget that flavourite nursing aid Mr Cherry Garcia!! So happy to hear that Dr. Ben and Jerry are treating you so well. Your card is fabulous, love the embossing on your chevrons, just perfect! Feel better soon. Love that you added texture to the chevrons! Great CAS design! Thanks for joining us this week at Color Throwdown! Great retro style card Hazel. Love the touch of textures on the strips. The sequins look very pretty. I'd be going back to that kind of medication too. :) Thank you for playing along with us at The Color Throwdown. Delightfully simple. I love the subtle shimmer on that card stock! And what great texture! Fabulous CAS card! Love the shimmer and the texture on the chevrons! Lovely card, Hazel! So glad to hear you are on the mend. So glad to hear that you are better, Hazel!!! Hoping that you will be A-OK in a day or two's time and that you will be chewing happily on anything you like!!! Oh, I love the beautiful CAS look of your card!!! Those embossed chevrons are so striking - love how you have used the colours!!!! And the three little sequins - so perfect to finish it off beautifully!!! Lovely, my friend!!! Had a great time visiting you again, Hazel!!! Have a great Sunday and enjoy the week!!! Haha,on the dr.! Glad you are feeling better! 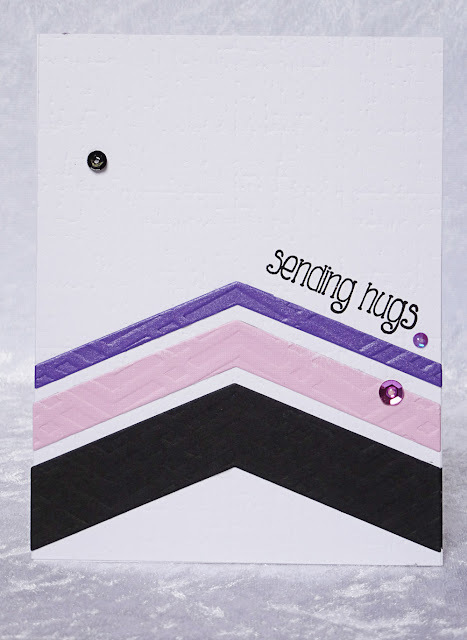 Love this wonderful card with the embossed pretty chevrons! Awesome job on the two challenges! A very bold graphic design, but the touches of the pastel stripes with the black created a very soothing overall effect. Really like this one! Good for you on the NBUS useage. I had put a moratorium on die purchases...think it lasted ?2 days! Can't wait to see your Zens. You can be brave if I did! I'm rubbish with the technique, but hey, I doodle anyway. Color some up, and share 'em! Hope the tooth infection is feeling much better. Those things are awful (DH gets them, I've been more lucky). Big Hugs & TFS. Ooh, great chevrons, Hazel! Love the embossing and the colors you chose! Love your chevrons and sparkle!! Great CAS card!! Glad you joined us at CTD!! 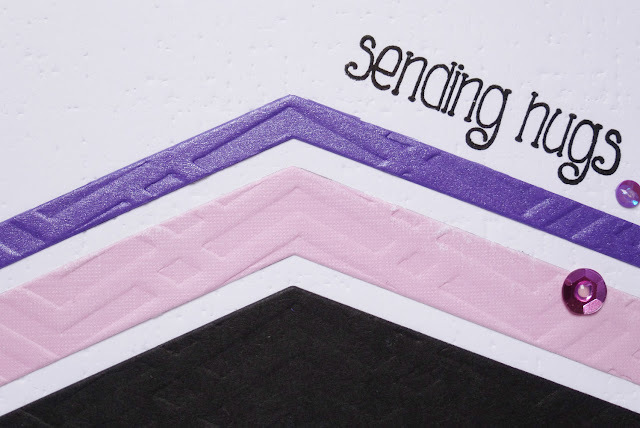 Simply beautiful Hazel, love the colours and the embossing to your chevrons looks fantastic. Such a beautiful graphic CAS card Hazel and I love those lovely colours. I'm so glad you are feeling a bit better and hope the week whizzes by until you get the stitches out. Your card is pure CASlicousness, Hazel!! I'm sorry I have been absentee over here for so long with my own health issues and vacation. I'm terribly sorry to hear about your operation, but truly after what it sounds like you've gone through, it is the best thing for you, even though it sounds horrific to me! I hope your healing is without any complications and then I hope you are completely well! You've certainly suffered long enough! As far as NBUS, well, of course, you know I'm going to say you're singing my song! After all, that's why I coined the terms NBUS and Mt. NBUS, and started my challenge! It's a PROBLEM and judging by the people who enter my challenge, it is one that we ALL share so you are not alone! 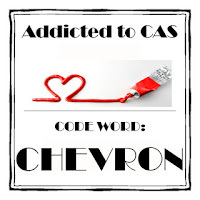 Perfect CAS card, thanks for sharing with us at ATCAS!